I haven’t posted in some time, but couldn’t let a RNWMV tradition pass without comment. 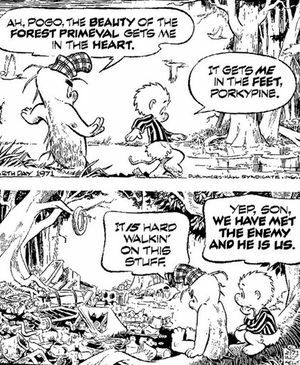 Every year since I began this blog in 2006, I have marked Earth Day by posting this cartoon, the creation of one of America’s greatest philosophers, Walt Kelly, artist and writer of the comic strip, Pogo. Since the first Earth Day in 1971, the phrase, “We have met the enemy and he is us” has become part of the American lexicon. Forty four years after the first Earth Day, it is hard to be terribly optimistic about the idealistic goals of the Earth Day movement. The “Green” movement has grown steadily, but faces a situation where change might be “too little, too late”. See, for example, this article from the current issue of Scientific American, Have We Passed the Point of No Return on Climate Change? Although, over the years, the enemy has coalesced into the climate deniers, politically, the “Green” movement has it’s supporters, including President Obama and the Democratic party, who have become increasingly willing to call out Republicans who remain vocal climate change deniers. Politics aside, perhaps the most hopeful sign for Earth Day, 2015, is that investors are now making money by going green. Forbes has a list of solar and clean energy exchanges that are easily beating the S&P 500. The Earth Day Network is still alive and well. It would be worth your time to visit their site and see how you could contribute while there is still time. Update: President Obama uses Earth Day to talk about climate change. I have always loved this “Pogo” cartoon by Walt Kelly. If fact, I have a signed and framed 3′ by 2′ poster hanging in my office. As today is Earth Day 37, I have been thinking about whether the enemy is, in fact, us. I don’t think so. I think the enemy consists of those giant corporate polluters from Exxon to General Motors to Monsanto who profit immensely from the destruction of the Earth, and who intend to continue no matter how overwhelming the evidence is for global warming. We are the enablers. We are the ones who lack the political will to elect politicians who will face the ecological crisis. Sure, we individually can do the right things by changing our light bulbs and switching to hybrids, but the corporate polluters will continue their global ravaging and despoiling as long as it’s profitable to do so and they can legally get away with it.